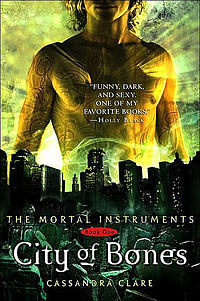 I read CITY OF BONES in a deliberately deconstructive manner. I wanted to see what worked and why. So this is perhaps an unusually, er, structural, review thingy. First off, Clare nearly lost me on page three, where the POV character did something to the effect of “my flashing green eyes scanned the room,” which, well, how damned often do you say, “My clear blue eyes lifted to the heavens,” even if you’re deliberately describing what actions you took? The color of your eyes is not likely to come into it. I haaaaaate that. Really hate it. So I put the book down in irritation and it took about three days to convince myself to pick it back up. Overall, though, I’m glad I did. That was the only incident of that kind of writing, and honestly, the first chapter in particular feels polished, refined, rewritten, sparkled, shone, polished, refined, rewritten, sparkled, shone, and polished, refined, rewritten, sparkled and shone. It’s a little painful. But it gets better. Quite a lot better. The writing is very description heavy, which isn’t my thing, but it’s well done and evocative. And since I was reading it to find out what worked, well, okay, that worked. The first several chapters haul things around nicely: there are at least three separate moments where Clare is building to a confession or climax or big moment, and each one is interrupted by Something Dire, so by fairly early in there are three subplots going that all drag you in emotionally. Very well done. *Very* well done. Ted read the book before I did. I was less than five chapters in when I asked him about a spoiler. He stared at me, I said, “It’s okay, tell me,” and I was right. Then I asked him about another one and he stared at me some more and said, “Do you really want me to tell you?” Nevermind, I said, I’ll just read it. But I was right about that one too. And indeed about every other plot twist and reveal throughout the book. The only surprise was in a tertiary subplot. This is not necessarily a bad thing. I mean, work with what works. And I’m something more than twice as old as the target audience, so probably things I thought were obvious and telegraphed aren’t quite as clear-cut to a 17 year old. There are at least a few things that I got way earlier than I think most (YA, anyway) readers would. But I was also deliberately reading it in deconstruct mode, so I was *prepared* for hints, y'know? I think her groundwork was pretty good, but writerbrain was on top of it. "I scanned the room with my maddeningly indeterminate eyes, all the while wondering what color they were." Hee. Brad also has hazel eyes (brown-green in his case) so I enjoy seeing what color they have decided to be. But it's rather easier to observe someone *else's* eyes. You know they're making a tv show or a movie or something from this? I imagine you do. The promo poster features a knife made by some friends of mine (http://www.omegaartworks.com/).